It gives me immense pleasure to be here today to inaugurate the National Conference on ‘Doubling India’s Food Production in the Next Five Years’, being organized by the Ministry of Agriculture and the Crop Care Federation of India (CCFI). I am glad to be a part of this august gathering comprising policy makers, representatives from the agrochemical industry, and eminent intellectuals and scientists. In the context of pursuing inclusivity in economic growth, it is of primary essence to achieve the inter-dependent objectives of poverty alleviation, mitigation of food inadequacy, creation of rural employment and growth in rural incomes. Substantial expansion in the country’s food production will greatly facilitate in meeting these objectives. The subject matter of this Conference is therefore apt and I applaud the efforts of the organizers to bring an issue of topical importance to the forefront of national policy discourse. A country’s development is dependent on the productivity of its people. Unless the health of our population is secured, we may not be able to realize the progress that we have envisaged for our nation. With a growing population, the challenge before us is not only to ensure that the indicators of food security do not deteriorate, but instead show improvement. Food production therefore deserves high priority in our national policy formulation. Food deprivation cannot be allowed to continue. Steps are required to secure for the poor and the needy greater access to food. Our democracy is committed to ensuring for its citizens social, economic and political justice. We have relied on a rights-based method and empowered our citizens with legal entitlements. The landmark Mahatma Gandhi National Rural Employment Guarantee Act of 2005 is one such example. I am hopeful of the proposed legislation for provision of food security to our people becoming a reality very soon. In terms of growth, India’s Agriculture sector has lagged behind the other sectors of the economy. The contribution of Agriculture to the country’s national income has therefore declined over time. From about 23 per cent during the Ninth Five Year Plan period, the share of this sector has come down to about 15 per cent during the Eleventh Plan period. Yet, in a country with one-third of its rural population below poverty line, the potential of the agriculture sector for rural rejuvenation cannot be undermined. About a half of our country’s population depends on agriculture for livelihood. Some studies have indicated that a one percentage growth in agriculture sector is two to three times more effective in reducing poverty than a one percentage growth in other sectors. The growth of the Agriculture and Allied Sectors decreased from 7.0 per cent in 2010-11 to 2.8 per cent in 2011-12, and to 2.1 per cent in the first half of the current financial year. This deceleration is perhaps reflective of the challenging economic scenario, but I am confident of this situation being reversed quickly. Agriculture ought to be an effective agent of change in rural India. We have envisaged the agriculture sector to grow at 4 per cent per annum during the Twelfth Five Year Plan. The agricultural growth in the Eleventh Plan period was mainly due to improved agricultural prices. As demand for major crops are projected to slow down during the Twelfth Plan period, we will have to rely primarily on productivity gains to attain the targeted growth. The eastern region of our country is bestowed with abundant natural resources and has the potential to achieve much higher crop productivity. At the same time, rice production in agriculturally advanced areas of North-Western India is becoming unsustainable due to over exploitation of natural resources like land and water. We have devised a strategy for increasing production and productivity in the Eastern region to ensure food security, while reducing pressure on North-Western region. To achieve this objective, a four-pronged strategy was delineated as part of the Union Budget for 2010-11 covering agricultural production, reduction in wastage, credit support and thrust to the food processing sector in order to spur inclusive growth, enhance rural incomes and sustain food security. As part of the strategy, it was decided to implement ‘Bringing Green Revolution to Eastern India’ (BGREI) programme under Rashtriya Krishi Vikas Yojana in Assam, Bihar, Jharkhand, Eastern Uttar Pradesh, Chhattisgarh, Orissa and West Bengal to address issues of rice based cropping system in these States with an outlay of Rs. 400 crore each in 2010-11 and 2011-12 and Rs. 1000 crore in 2012-13. As a result of these initiatives, farmers in the selected clusters have adopted good agricultural practices like use of drum seeders in direct seeded rice, line sowing, system of rice identification, improved flash flood tolerant and drought tolerant varieties of rice and have gained from the yield advantage of hybrid rice technology. I am told that the sustained efforts of the past three years have produced very encouraging outcomes, in terms of significant increase in the share of the Eastern region in the total rice production in the country. Of the total rice production of 104 million tonnes in the country in 2011-12, a record production of 55 million tonnes of rice was contributed by the Eastern region. I am happy to note that a Committee has been constituted under the chairmanship of the Union Agriculture Minister with the Chief Ministers of the ‘Bringing Green Revolution to Eastern India’ States to provide fillip to the implementation of the programme. I am told that this Committee has decided to focus on procurement of rice during 2012-13, besides ensuring timely availability of credit facilities to poor farmers. It is gratifying to know that an Apex Committee on Agriculture for Eastern India has been constituted under the chairmanship of the Prime Minister to provide impetus to the ongoing efforts for agriculture development in that region. I am confident that this would provide the line departments such as power, irrigation, finance, fertilizers, marketing and cooperatives a forum to converge their activities in identified clusters so as to achieve integrated delivery of services to the farmers. We should place greater emphasis on productivity-driving measures such as diversification of crops, improvement in seed replacement rate, adoption of high yielding hybrid seeds, and improvement in water management practices. India is one of the leaders of the information and communication technology revolution. We must resort to greater use of satellite communication for weather forecasting and to information technology for its effective dissemination to the farming community. In addition to these steps for prevention of crop failure, we must strengthen mechanisms such as agricultural insurance to manage the risk of crop failure due to natural calamities, pests and diseases. The Green Revolution in the Sixties brought about a considerable rise in the food production but the disproportionate use of chemical fertilizers eventually led to a decline in food grain productivity. The need for balanced use of fertilizers and pesticides should be propagated amongst our farming community through agriculture education and extension programmes. The first Green revolution was restricted in terms of geography. We should usher in a second Green revolution that is widespread and which touches all arable land in the country. The total food grain production of the country increased by 12 million tonnes in 2011-12, from 245 million tonnes in the previous year. In 2012-13, the food grain production in the Kharif season is estimated at 117 million tonnes, which is lower than the 130 million tonnes of food grain production in Kharif season in the previous year. In the context of the current production levels, doubling food production in the next five years will be a great challenge and test of our capacity to successfully employ all possible growth-inducing measures. Quantum jump in food production will have several positive spinoffs. It will drive investment in infrastructure for storage, processing, transportation and packaging. It will also boost the prospects of the agro-processing industry. It will create jobs in the rural sector. Capacity building of our rural youth should therefore go hand in hand. Better livelihood opportunities in rural areas will reduce the pressure of migration on urban centers. Growth in food production will also help in conservation of natural resources. With the technologies at our disposal, it will be possible to utilize farm waste from increased food production as feed for livestock and aquaculture. This will reduce pressure on forest lands which are currently used as pastures for grazing animals. 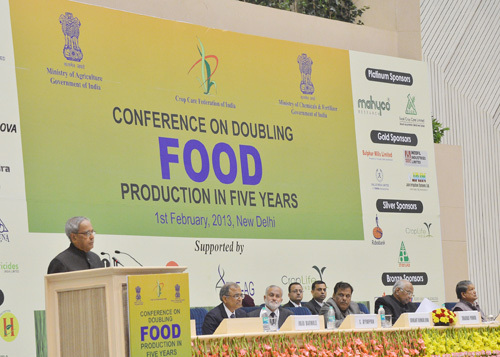 Doubling the country’s food production is an imperative that we cannot ignore. It will be possible to arrive at ways and means of achieving this feat only through extensive consultations. I congratulate the Ministry of Agriculture and CCFI for providing a platform to facilitate a greater understanding of this issue by all stakeholders concerned. I am hopeful of meaningful answers emanating from this deliberation. I wish the organizers every success in conducting this Conference.